Location: County Limerick, Northern Ireland. Notes: Castle Oliver (also Clonodfoy) is a Victorian mock castle in the south part of County Limerick, Ireland. Built for entertaining rather than for defense, it has a ballroom, drawing room, library, morning room, dining room and hall which feature hand-painted ceilings, decorated ornamental corbels, superbly executed stained glass windows and stencil work. 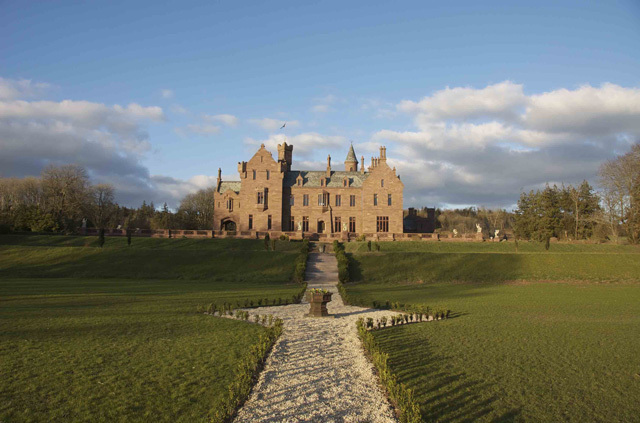 The castle stands on massive terraces and has a commanding view over much of its former 20,000-acre (81 km2) estate. The castle has Ireland's largest wine cellar, said to hold approximately 55,000 bottles. From May to September 2014, Castle Oliver was opened to the public in conjunction with "Limerick City of Culture" for house tours. In 1988 it was purchased by the late Damian Haughton, who according to the subsequent owner, put a halt to most of the worst leaks in the roof. In 1998 it was purchased by Nicholas Browne, who continued the restoration work and transformed it back into a habitable residence. In 2006 it passed to Declan and Emma Cormack, who completed high-grade restoration work and made the castle their home. In 2015 the Cormacks sold it to an unnamed family from Melbourne, Australia to use as a home for "several months of the year".